It's time to get spooky, kid style. These Halloween Party Ideas for Kids are still fun, scary, and festive, but they're not spooky enough to upset any of your friends. Halloween crafts for kids can be a blast without being gory or gross, and these great Halloween party ideas prove that. Get creative with these brilliantly funny and clever ideas that will leave your guests talking about this party for years to come. 1.) To make the webbed tablecloth, start with a long strip of tape from one corner of the table diagonally to the opposing corner. Then add a few radiating strips from the same beginning corner. Go back and cut small pieces to fill in between each of these strips. 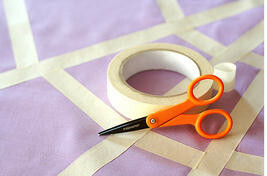 You could also begin in the middle with criss-crossing strips to center a web. 2.) To make the spider plates, cut eight 8.5 inch long half-inch strips of black cardstock with your paper trimmer, and run each leg through the paper crimper. 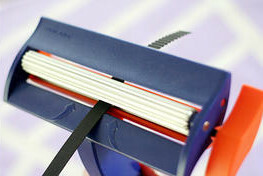 Fold each strip in half and fold back a small tab at each end. Hot glue one tab under the rim of a black paper plate. Continue with four total legs on each side. Punch circles for eyes and hot glue to the edge of the plate facing each guest. 3.) 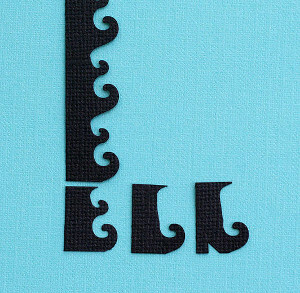 To make the sand-witch toppers, run a 3/4 inch wide strip of black cardstock through the border punch and cut into sections as shown, at the bottom of each large curl. Trim off the small curl with scissors and cut a small triangle into the heel. Add a striped leg to each boot and adhere to toothpicks. 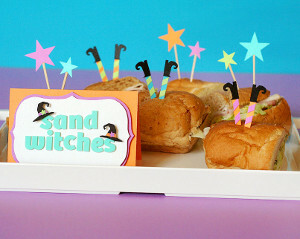 Insert in pairs into sandwiches for a non-spooky take on witches. Mix it up by adding stars and witch hats. The limited edition ‘Hats Off’ lever punch is a great witch hat. Add a small trim of color and a 1/4 inch star for easy embellishment. 4.) Another limited edition lever punch that I consider a must-have is ‘Laughin Jack’. This jack-o-lantern face could add instant personality to all kinds of party items. 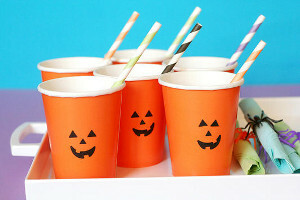 Punch it from yellow cardstock to layer onto any black party items or goodie bags, or punch from black to add to orange items, such as these paper cups. 5.) 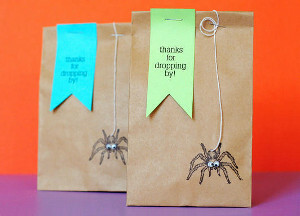 Use a spider stamp, and stamp it directly onto small treat bags, and cut a small slit using a craft knife to insert white string. Tape the string inside to secure. Staple the string at the top of the folded bag once stuffed for an interactive web. 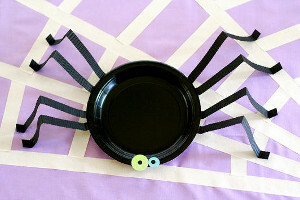 To give the spider a sillier look for the kids, add small googly eyes! 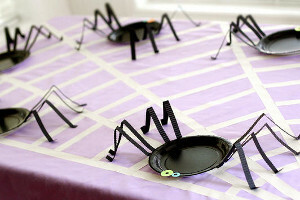 There are 3 great ideas for a halloween party decoration by making the table festive too By starting with a spider web table cloth and then make the plates to go on it and last a spider treat bag fot the goodies for your guests. They are all great ideas. I would even use these at an adults party too.